Hi. I know many people visiting my blog today were directed from Joe Konrath’s blog (thanks for the shout out, sir). A lot of people had very kind things about me and my books, and I thank them for that. If you haven’t read Joe’s blog, you can check it out: here. And if you’re interested at all in writing or publishing in the near future, I suggest you check his blog in general. He does a much better job of explaining things than I do. I like to pretend that it’s all magic, and leave it at that. But somebody asked for proof. Even though I know I don’t have to give proof, I don’t like insinuations that I’m a liar. I’m many things, but I’m not a liar. So I’m posting what proof I have. I didn’t take screen shots on the sixth or seventh, when I actually reached the 10,000 mark. But I did take them just now. The Barnes & Noble is tricky because it’s a cumulative of all the books I’d sold through them since the beginning. 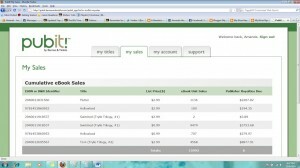 So, I have to subtract the amount of books I sold through them prior to Dec 1st, which was 10,605. 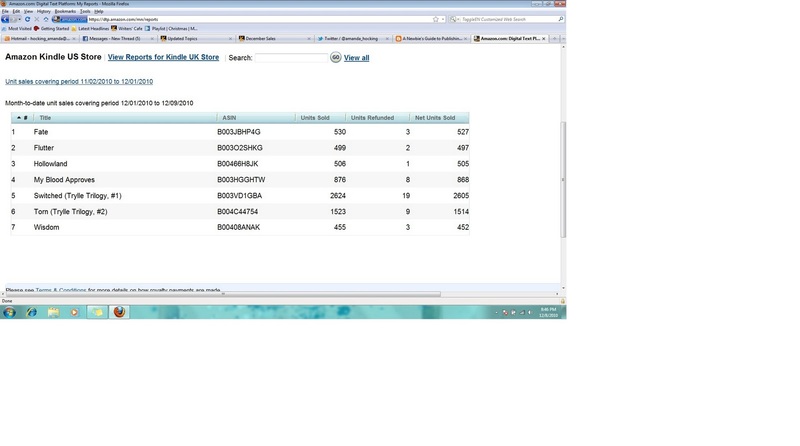 So, at the time of the screen shot, I’d sold 5,387 books through them in the month of December. If you add up those three totals, you get a grand total of 12,598. 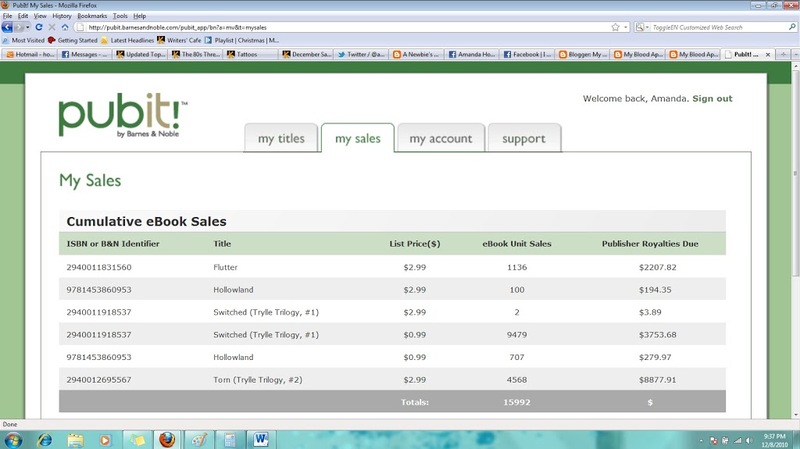 Since today is the eighth, I think you can agree it’s a safe to say I’d sold 10,000 books as of two days ago. But something else that I haven’t mentioned – I’m selling 4 of my books directly on Barnes & Noble. Three of them – My Blood Approves, Fate, and Wisdom – are being sold through Smashwords. 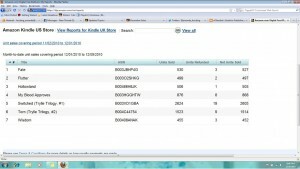 And Smashwords is horrible at reporting how many books I’ve sold through them. I can roughly estimate, and you can see how many books I’m selling of Flutter (the third book in the series) through Barnes & Noble, so I imagine that Fate and Wisdom are selling comparably well, and My Blood Approves, being the first book and the cheapest, is probably selling a bit better. I’m not going to speculate on sales, but I’m fairly certain that my actual sales for December (thus far) are higher than 12,598. For those of you asking how I did it, it’s all fairly simple – I wrote a lot of books. As of today, I’ve written sixteen novels, four novellas, at least fifty short stories, a screenplay, hundreds of poems, a one-act play, and I have two works in progress, plus the outlines for an additional six or seven novels. And that says nothing for the incomplete works I’ve started and for the trunk of notebooks filled with half-finished ideas in my bedroom. Of all that stuff I’ve written, most of it will never be fit for publication because it’s just not very good. I stand by most of it being good when I wrote it – meaning I wrote a really great short story for a twelve-year-old or a pretty good novel for a seventeen-year-old. But that doesn’t mean they’re good enough to be published and read. Just because you write something, doesn’t mean other people should read it. If you want more in depth information, I covered most of it in a previous blog I wrote, which you can check out: here. And as I’ve said before, a lot of this has seemed easy to me and it appears that it’s come easy for me and happened suddenly. But I have been writing continuously pretty much entire life. That’s not even an exaggeration. I wrote my first short story by the time I was five. And I’ve written hundreds of thousands of words since then. And I haven’t just been writing. After I turned eighteen, and I got really serious about being published, I spent a lot of time researching the publishing world and learning and getting critiqued and critiquing others. What I’m saying is that I’ve been working my whole life for this. I’ve spent twenty-six years writing, and eight years studying what it takes to make writing my career. I write commercial fiction, with nice covers and good prices. 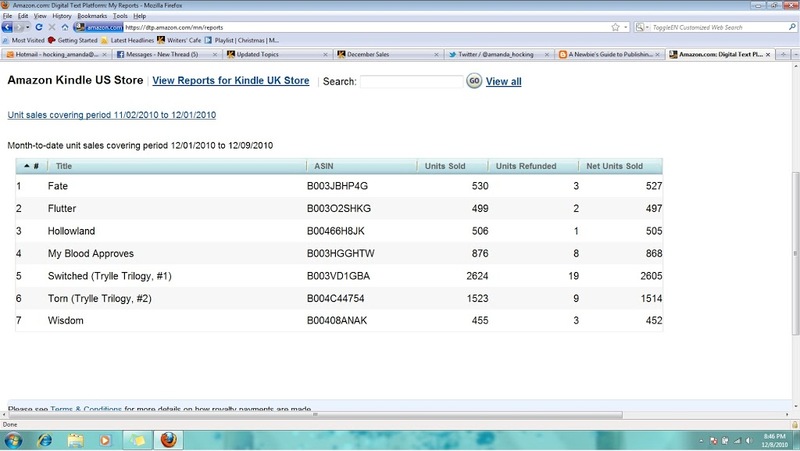 And I happened to publish during an ebook revolution. So if you want to know the secret to my success – it’s all that right there. You are an inspiration amanda i wrote the below book, but been unable to move even a single copy so far. I promise i’d work harder to promote my book. I personally purchased your Trylle book series from Barnes and Noble and I love them!!!! Where can I find the release date for the next installment? I am hooked and dying to read the next!!!! Thank you! Congratulations on your success!! — I think there’ll always be some people asking for “proof,” so the occasional screenshot can be good (though one is not required to entertain such doubt, if one wishes not to ^^). I think your last paragraph really says it all — I hope the success of indie authors like yourself/JA Konrath/Karen McQuestion etc inspires other indies to keep going (or inspires those that are “on the fence” to jump in). High time evil empires got whacked. Awesome, Amanda! I am so happy for you and hope things will get even better for you as the ebook market continues to grow. Thanks for sharing numbers. So few indie authors do, and it’s a nice bit of encouragement for those of us just getting into it. Plus, it’s great to see authors having such great success!